You know what's worst of all? The treatment for chronic overeating is to think about every food choice you make for the rest of your life. At various points in my journey, I've been asked if I would write a book, at that moment or in the future. At various points in my journey, I have considered it, with varying degrees of enthusiasm. I am constantly blown away by the number of people who reach out to me and say I went back and read your blog from the beginning, like a book. My heart is so full of love and joy when I hear about people who are inspired by my story - and I love hearing from people who have been on similar paths or have had similar experiences, people who reach out to me and remind me, you are not alone. Right now, though, I can't say for sure. I would like to think that mine is a story that people would like to read more about, but at this stage in my life (and at this point in my progress), it doesn't quite feel right. 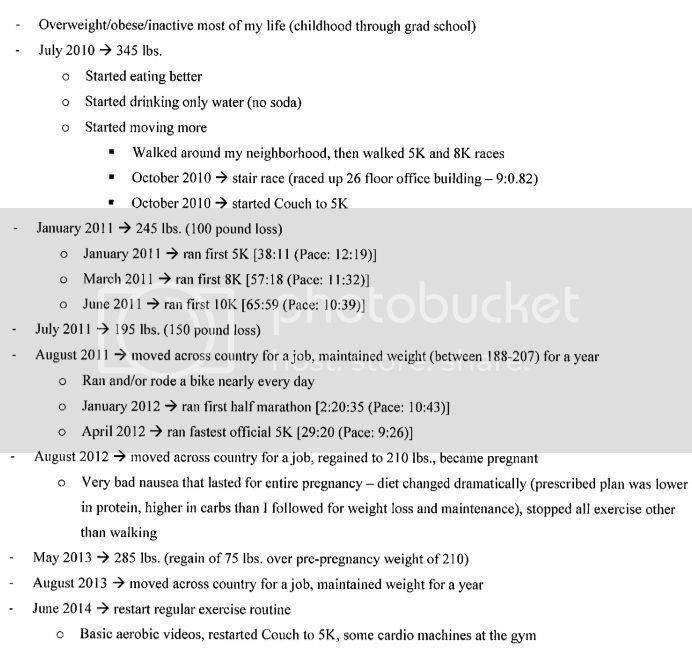 I mention this because yesterday, I got a follow-up about the fitness leadership program, and I had to fill out a medical form with my weight history. I summed up 3-4 years of struggling, of successes, and of tears in less than a page. It's more detail than they wanted, I'm sure. But it's my story, and it's important to me. Over the years, I have found a lot of parallels between my struggles and the stories of people with addictions, particularly in the ways we try to recover. In many programs, an alcoholic will still refer to his or herself as an alcoholic, even after he or she stops drinking - that struggle is part of their identity, and there's a big risk in forgetting that past. Saying I was an alcoholic, but I am fine now, I can handle one or two drinks... might be okay for some people, but for others, it is a slippery slope down a dangerous path. Even once the weight loss part of my journey is over, I will be a person in maintenance - which is the same road, I will just be driving a different car. So I don't ever want to forget that I was once 345 pounds. When you do that, you start to get careless. Well, I used to be super obese, but I am smaller now, I can binge once or twice and get right back on track. I know this because I was there, and that was me. I was smaller, but I was still trying to hide behind my body. I thought I had cured myself, I thought I had moved past using my weight as a barrier between myself and my truths. But the truths were still there, despite the smaller clothes and the faster per-mile running pace. I don't know if me writing a book would help or even interest anyone else, but I think maybe, perhaps, someday, possibly, I will write one, if only just for me to preserve these moments, to recall these experiences, and to help myself to never forget this part of my identity. I am one of those that went back and read your blog from start to finish and I really like how you write. When you decide to write a book I will definitely be interested on getting it. I wish you success with the weight loss & maintenance as well as with your family. Thank you for the inspiration. I think I decided to run my first half marathon thanks to you, and now I have run 5 so far, even thinking about a full next year. I usually lurk but I was inspired by you to try to do this exercise for myself. It was hard and really emotionally intense to do. I couldn't get mine down to a page either -- I felt like there was so much to go into. I applaud you having to share it with someone; mine still feels too personal even to re-read. My brother is an alcoholic (recovering), and I have whatever food addiction/eating disorder that I have. I think of myself as "a recovering binge eater" (although I have never been formally diagnosed), and I strongly identify with my brother and his struggles. Why I read and comment on your blog is because our highest weight was the same, our lowest weights were close, the dates of our journey are similar. I ran a 5k though my body said no to more, but I enjoyed reading about your running. We've both had ups and downs. Now up as well about -after maintaining the 100 lb loss for a couple of years I regained 60 lbs and now have lost about 20. You are 100% right that some form of monitoring or measuring or recording or daily dealing with this 'food thing' is for life...glad you are blogging again . I was just think how I missed reading this blog and u pop up on Facebook. Can't wait to catchup.